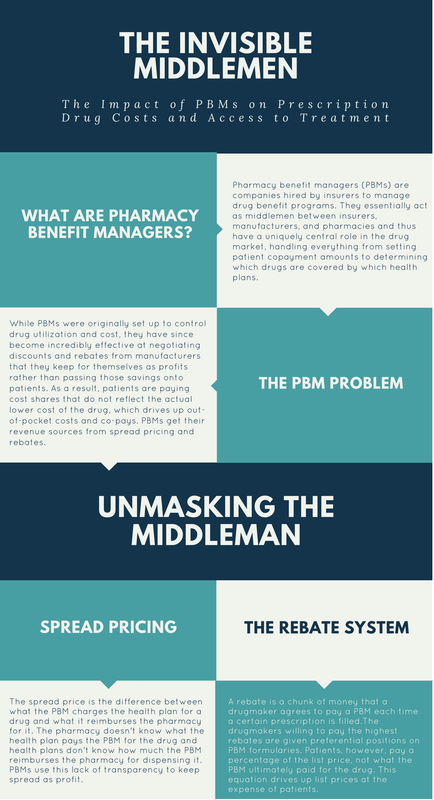 Why do Insurance companies use Pharmacy Benefit Managers? PBMs claim to help control costs for both their clients (insurance companies) and consumers (patients). However, due to the lack of transparency, there is no sufficient evidence that PBMs have helped control costs on behalf of patients. Since their creation, out-of-pocket expenses have increased and many patients continue to struggle with the high costs of prescription drugs. While PBMs were originally created to control drug costs on the whole, they have since done the opposite. The lack of oversight and transparency around their pricing practices has greatly contributed to the problem. What role do PBMs play in driving up the cost of drugs? While PBMs were originally set up to control drug utilization and cost, they have since become incredibly effective at negotiating discounts and rebates from manufacturers that they keep for themselves as profits rather than passing those savings onto patients. As a result, patients are paying cost shares that do not reflect the actual lower cost of the drug, which drives up out-of-pocket costs and co-pays. In some cases, PBMs may also push manufacturers to increase their drug’s list price in order to be included on formularies. This video from RxPreferred Benefits will help explain the various ways that PBMs are able to take advantage of consumers and why legislation requiring PBM transparency is necessary. 1 Transparency helps the market work better. It allows plan sponsors and payers, including large corporations and governments, to confirm that a PBM is in fact providing the service it was hired to do: to secure low drug costs. 2 Without transparency, a plan sponsor has no way to verify that their PBM is sharing manufacturer rebates or that the PBM is negotiating the lowest possible costs for specific drugs.